Help destroy Dark Anchors in Tamriel. Cardea Gallus of the Fighters Guild learned of Worm Cult activity in <zone>. Speak to Cardea Gallus in the Fighters Guild in Elden Root (Grahtwood), Wayrest (Stormhaven), or Mournhold (Deshaan). Venture to the specified zone and investigate the Dark Anchors. Find the Fighters Guild Hall in any Alliance capital and speak to Cardea Gallus. She will give you a contract to destroy Dark Anchors in one of the 15 primary base game zones. Each zone has three regions, each of which contain one Anchor that you can destroy. When you have destroyed three Dark Anchors in your designated zone, return to Cardea Gallus and tell her that you have done as she's asked. Cardea thanks you for your assistance and rewards you with gold and a special guild crate, which contains low quality equipment, consumables, and sometimes chapters of the Draugr style motif. "The amount of undead wandering Alik'r Desert raised concerns with the local chapter. As a precaution, they requested additional patrols to stamp out any Worm Cult designs on their lands. 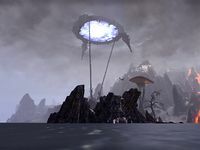 Head to Alik'r Desert and destroy any Dark Anchor you find." "Yes, the chapter already sent its regards for your work. Should they need additional aid, they've requested I send you their way." "The Auridon chapter questioned some locals about Worm Cult activity. They denied it and insisted if there were a problem, they'd handle it themselves. That's the Summerset way to ask for help. Head to Auridon and destroy any Dark Anchors you find." "I heard. The Auridon chapter has received dozens of complaints for "jamming our noses in High Elf affairs." That's what they call a Summerset thank you. Good work." "The Bangkorai chapter sent a troubling report. An Imperial Legion has wreaked havoc in their region. The chapter suspects the Worm Cult isn't far behind. We can't let them gain a foothold. Destroy any Dark Anchors you find in Bangkorai." "I used to spar with the legionaries before the war. They were fearsome enough in a practice ring. I hope they didn't cause you any trouble in Bangkorai." "Ordinators from Mournhold have forbidden the Deshaan chapter from rooting out the Worm Cult. They consider it a "politically sensitive matter." Well, I consider the Worm Cult a threat to all of Tamriel. Destroy any Dark Anchors you find in Deshaan." "I heard. I already received a dozen letters from the temple in Mournhold, each protesting Fighters Guild involvement in their affairs. I thanked them for restocking the latrine. "Our Eastmarch chapter is brimming for a fight with the Worm Cultists. They put out a call for "all to join in our glory." That means they're understaffed and need some help. Head to Eastmarch and destroy any Dark Anchors you find. "Yes, the Eastmarch chapter said your name would be carved into the halls of Sovngarde. But they didn't send gold. Your deeds are good enough to commemorate for all time, yet they left me to pay the reward. Typical for the Eastmarch chapter." "The Glenumbra chapter there are too many armed groups maneuvering across the landscape to count. They believe some are in league with the Worm Cult. Can't have that. Destroy any Dark Anchors you find in Glenumbra." "Then our Glenumbra chapter can breathe easier. The turmoil in their region will keep them busy for quite some time. Best the Worm Cult isn't a part of that turmoil." "Our Grahtwood chapter has an open contract to seek out Worm Cult activity. Valenwood has long resented Molag Bal's destruction of Gil-Var-Delle, so Elden Root is happy to foot the bill. The task is simple. Destroy any Dark Anchors you find in Grahtwood." "King Camoran Aeradan will be happy to hear we've jammed a thumb in the eye of Molag Bal. If we're lucky, he'll throw us a feast." "A Wood Elf priest—a spinner—approached our Greenshade chapter. He spoke of dark skies above worm-ridden soil. Prophecy is Mages Guild nonsense, but it can't hurt to patrol Greenshade for Worm Cult activity. Destroy any Dark Anchors you find." "The spinner's warning was real, then? I bet the hall steward he'd ingested one too many Valenwood mushrooms. Good for Tamriel, but bad for my coin purse." "I have concerning reports from Malabal Tor. An ongoing conflict with Wood Orcs has diverted our chapter's attention. The Worm Cult may be taking advantage of the distraction. As a precaution, head to Malabal Tor. Destroy any Dark Anchors you find." "Good. I'll make certain the Malabal Tor chapter learns of your aid. We can't afford to let trivial concerns distract us from our goal." "The Reaper's March sends an urgent request. From the way it reads, Worm Cultists have overrun their lands. That hall steward is prone to exaggerate, but they sent the funds, so ... destroy any Dark Anchors you find in Reaper's March." "As bad as reported, then? Must be all the turmoil around that Khajiit leader of theirs. The Worm Cult takes every advantage of instability." "Our chapter in the Rift needs assistance. Some jarl took personal affront to Worm Cultists invading his lands and opened a contract. I'm sending everyone I can muster. Destroy any Dark Anchors you find." "Excellent. It's not often I thank the Eight for the wounded pride of a jarl, but I won't complain if it keeps Worm Cult plots in check." "The Rivenspire chapter's focus is on killing bloodfiends, which means they need help rooting out the Worm Cult. Destroy any Dark Anchors you find in Rivenspire. And watch yourself—the bloodfiends are everywhere." "Doesn't look like a bloodfiend gnawed off any of your limbs. Even better, you weren't hopelessly lost in the mountains. That's victory in my book." "Some treeminders approached our Shadowfen chapter. Though they've seen no evidence of the Worm Cult, they've dreamt it for some time. For my own peace of mind, head to Shadowfen and destroy any Dark Anchors you find." "So the treeminders were right. Over the years I've learned to trust their dreams. Must be all the time I spent with Sees-All-Colors." "Volcanic activity has our Stonefalls chapter second guessing reports of Dark Anchors. They say nothing is out of the ordinary. I'm not willing to take any chances. Destroy any Dark Anchors you find in Stonefalls." "Good. I've already told the Stonefalls chapter to increase their patrols. If the Worm Cult gets a foothold, volcanic activity will be the least of their problems." "The Lion Guard forbade the Stormhaven chapter from seeking out the Worm Cult. Seems they want the glory for themselves. But you're not associated with that chapter, so Lion Guard pride be damned. Destroy any Dark Anchors you find in Stormhaven." "And nothing from the Lion Guard, which doesn't surprise me. Wayrest politics is all about displaying wounds that were self-inflicted. If the Lion Guard complains about their missed opportunity, I'll send them a mallet." It is possible to share these quests with others. You can clear one and the same Dark Anchor several times in the specified zone; it will count towards the quest. I should destroy any Dark Anchors I find while I'm there. I should return to Cardea Gallus in my Alliance capital and tell her I've destroyed the Dark Anchors. Finishes quest I should tell Cardea Gallus I've destroyed the Dark Anchors.